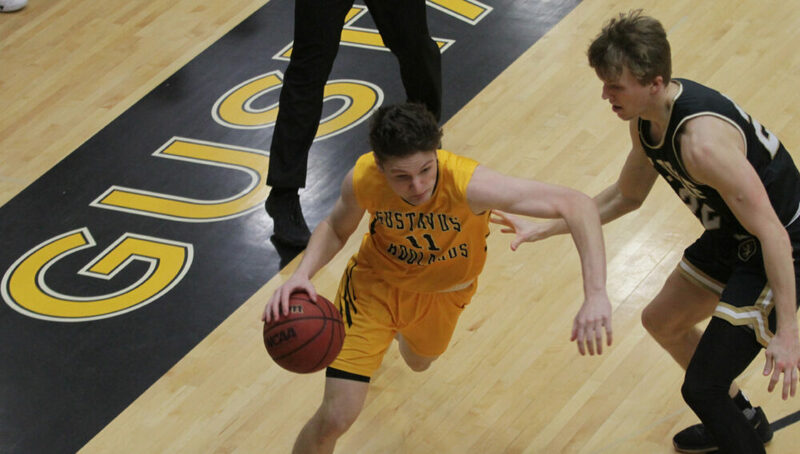 SAINT PETER, Minn. – The Gustavus men’s basketball team outscored St. Olaf 40-21 in the first half en route to an 82-70 victory. With the win the Gusties move to 8-10 overall and 5-8 in MIAC play while the Oles falls to 9-9 overall and 8-5 in conference play. The game got off to a fairly slow start with Gustavus leading just 5-4 four and a half minutes into the game. The Gusties got hot on the offensive end though and stout on the defensive end when they went on a 22-7 run that was capped off by a Logan Rezac (So., Andover, Minn.) three-pointer with 7:20 remaining in the half. The Oles cut the lead to 13 with 5:17 to play but Gustavus closed the half on a 11-5 run to hold a 19 point cushion going into the break. At the half, Rezac led all Gusties with eight points. Gustavus shot 66.7 percent from the field while holding the Oles to 23.5 percent in the first 20 minutes. After a Gustie basket to start half number two, the Oles went on a 8-0 run to cut the lead to 13 but an Isaac Douglas (So., Montevideo, Minn.) bucket broke the run and then Charlie Krambeer (Sr., Rushford, Minn.) knocked down triples on back-to-back possessions to help the home team gain an 18 point edge. The two teams then traded baskets for over ten minutes with the Gustavus lead staying between 14 and 19 the entire duration. With the Gusties up 19 with 6:26 remaining the Oles started chipped away at the leading going on a 7-0 run to trim the lead to 12. St. Olaf kept plugging away and was able to shrink the lead to nine points with 2:15 but Gustavus answered the call and knocked down free throws late to take the 12 point victory. On the night Spencer Tollefson (Sr., New Richland, Minn.) led all Gusties with 15 points to go along with three assists. Riley Sharbono (Sr., Marshall, Minn.) and Douglas both also finished in double figures with 11 points each with Sharbono pulling down five rebounds. The Gusties will next be in action on Saturday when they travel to Saint Mary’s for a 3 p.m. contest.